Element 46 is ideal for any collaborating musician recording on the go, at home or in a small project studio. 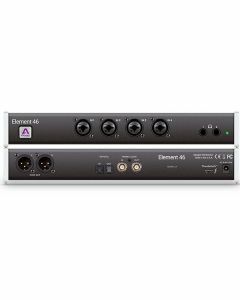 With four analogue inputs (including four world-class mic preamps), two headphone outputs and stereo speaker outputs, Element 46 is the perfect upgrade from an entry level audio interface. Premium A/D conversion is a prerequisite for capturing every subtlety of a digital recording. Apogee's Element series interfaces provide high-quality Apogee A/D conversion that diminishes noise and amplifies signal quality, creating tracks that sound brilliant and sit perfectly in a mix. You'll hear increased clarity in every track and virtual instrument. Tracks will blend more harmoniously, making precision adjustments and achieving the perfect mix balance easier. Apogee's Element Thunderbolt driver features impressive low-latency round-trip performance (1.41ms), along with unfaltering stability. This proprietary driver also uses less CPU power thanks to Apogee's Direct Memory Access (DMA) technology. The DMA implementation in the Element series allows the user to run more plug-ins and monitor through DAW at low buffer settings. You don’t have to choose between speed and power with Apogee Element interfaces.